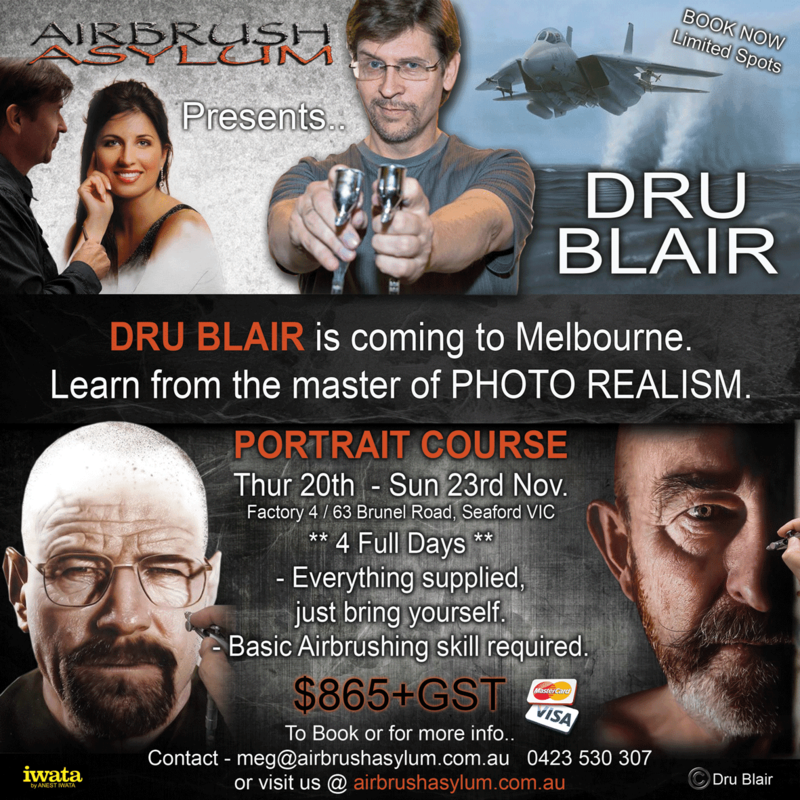 Dru Blair is coming to Melbourne, Australia to run a portrait course @ Airbrush Asylum. International artist and master of Photo Realism Dru Blair is coming to Australia...Thats right, you have the opportunity to learn from this amazing artist, as he takes you step by step through how to paint a photo realistic portrait in this 4 day course. Airbrush Asylum is honoured to be able to host such an amazing artist, and offer his course to his fans here in Oz. Click on the ‘enrol’ button above to secure your spot as we only have limited spots and this is sure to sell out fast. Q - What do I need to bring to the portrait course ? A - Everything is supplied, however Dru Blair has recommended that you bring a note book to the course as you will be receiving a great deal of information. Q - How skilled do I need to be with the airbrush to enrol in the portrait course ? A - Basic airbrush skills are recommended, however you don’t need to have completed any portraits in the past, or be at an advanced level to undertake the course. Q - What are the hours of the portrait course ? A - The course will be scheduled to start at 10am and run until early evening usually around 6 - 7pm. Q - What surface will we be painting on ? A - Dru Blair is supplying each student with synthetic art paper to complete their portrait artworks. Q - Is paint supplied ? A - Yes, Createx are supplying their illustration colour range paint. Q - Should I bring my own airbrush ? A - It is up to the individual, airbrushes will be supplied however it is recommended that you bring your own airbrush , as this is what you will be most familiar with. Q - What should I wear to the portrait course ? A - It is recommended that you wear old clothing as it is an art class and things can get messy. We don’t want you to ruin your best outfit. Q - How many students will there be in the class ? A - A total of 14 students will be booked into the course, this will ensure that everyone gets the most out of the portrait course. Q - Where will the course be held ? Q - How do I book into the portrait course, and pay my deposit to secure my spot ? A - Due to limited numbers, bookings will require a non refundable deposit of $400 to confirm your spot, leaving a balance of $551.50 which must be finalised on the first day of the course. Contact Meg to secure your spot, payments can be made via credit card over the phone .